The forecast is for 3-5 inches of snow tonight. It has already snowed at least 2". It is very nice out. We walked around outside for a little while with the snow falling on us. Grandpa bundled up Brannen and took him outside. Brannen thought it was really cool. So I decided to go outside with them. Dad took a few pictures of lights around the neighborhood. Our house barely holds a candle to a guy down the street. I bet we will easily get to the 5" in the forecast. Today was a beautiful winter day! At 38 degrees, it was perfect to go out and play in the snow with Leyton. 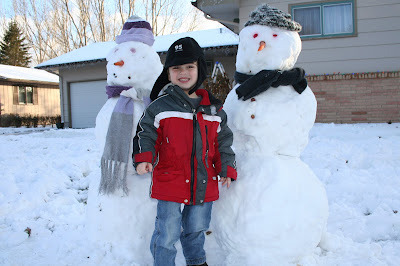 Brannen was down for a nap, so Leyton and I went out to make snow men. I lasted longer then he did, surprisingly. It was the first time this winter that conditions were just right to be able to go out and play - and it was fun!